These are really splendid transfers by Mark Obert-Thorn of two famous recordings of the two greatest violin concertos in the repertoire. It seems superfluous to add that the confluence of Heifetz, Koussevitzky and Toscanini makes for riveting listening. The Victors of the Beethoven preserved a performance recorded in Studio 8H and they bore all the obvious auditory features of that venue of airless deadening � limiting factors mitigated in this transfer to a successful degree. This performance and that of the Brahms have occasioned considerable debate � pro and contra � over the last sixty years, which must indicate something of their powerful individuality at least. I can imagine strong and convincing arguments on both sides and my own view is that the Brahms, though strongly personalised, is the more convincing and sensitive performance. Toscanini�s accompaniment in the Beethoven is inclined to abruptness, though he undeniably prepares for the soloist�s broken octaves entry far better than does Bruno Walter for Szigeti in their performance (also preserved on Naxos 8.110946). Heifetz�s seemingly effortless virtuosity (it�s a prerequisite of virtuosity that it "seems" effortless) is astounding, Toscanini full of complimentary orchestral clarity and architectural cogency. Heifetz plays his own adaptation of Auer�s cadenza in the first movement. What remains troubling is an air of fluent certainty. This is not a criticism of Heifetz�s peerless playing in a technical sense � rather a sense of not what is present but what is absent from the performance and what is absent becomes more distressingly clear in the Larghetto. This is a superficial and rather decorative, gestural reading laced by Heifetz�s luscious tonal resources. But no more than that. The finale is robust, vigorous � though surely a few of the scratches one can hear were eliminatable? � and Studio 8H exaggerates the aggressive precision of the playing. Some of the lower frequencies are overloaded and an over-congested perspective emerges. I can�t say Toscanini�s conducting here impressed me with welcoming affection. 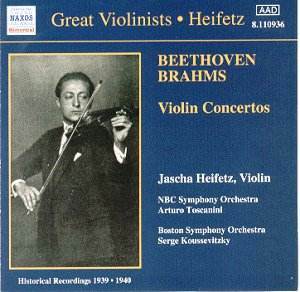 Koussevitzky directs a strong, fluid performance of the Brahms, a work that suited Heifetz�s emotive urgency rather better than the more complex intricacies of the Olympian Beethoven. He engages in any number of finger position changes that give muscular impetus and life to the solo line, flecking the first movement in particular with a spectacular array of ear titillating moments. Some of these are, admittedly, very spicy indeed and some may well feel him insufficiently weighty, sacrificing depth for sumptuous incident, rather in the manner of his fellow Auer-pupil, Toscha Seidel. But Heifetz never loses the architectural sureties here and is technically on something of a different plane to his contemporary competitors. Note that he plays the Auer-Heifetz cadenza in the first movement. I admired the second and third movements. The Boston oboist is impressive and Heifetz sensitive in the second movement. In the finale Heifetz�s forward motion cannot be, except superficially, equated with glacial indifference. As with his later recording of the work with Fritz Reiner, Heifetz�s Brahms is a muscular, powerful and convincing one on its own terms. Whatever one�s judgement these are durable examples of superior musicianship � though arguably not ones tinged with metaphysical depths � and to have them in such fine transfers, at such superbudget price, is reward in itself.